Avila, N.S. (2012). Neotropical Iridaceae. 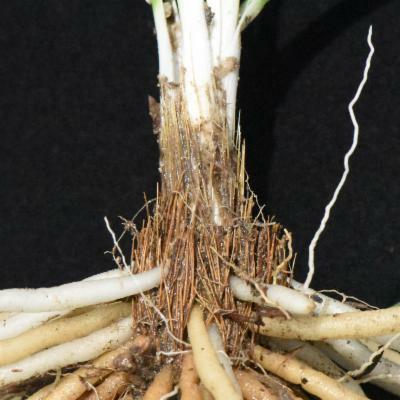 Perennial herbs or shrubs or annual shoot system from rhizomes or corms. Leaves simple , entire , flat or cylindrical, plicate or not, equitant or not, bi- or unifacial. Inflorescences spikes or monochasial cymes, exceptionally solitary flowers; scape erect , cylindrical or flattened, carrying bracts along its length or only at the apex . Flowers bisexual , actinomorphic or zygomorphic ; tepals free or fused; stamens 3, opposite the outer tepals, anthers extrorse, alternate or opposite to the styles; ovary inferior, trilocular, multi-ovulate with axile placentation, styles 3, free or partially united, stigmas entire or deeply divided . Fruits loculicidal capsules carrying one to many seeds per locule . Seeds globose or pyramidal. Molecular studies have shown that Iridaceae are monophyletic (Goldblatt & Manning 2008, APG III 2009), near Dorianthaceae and Xeronemataceae, while classic taxonomic studies place Iridaceae close to Liliaceae s.s. and Amaryllidaceae (Hutchinson, 1973). Although Iridaceae are monophyletic and easily distinguishable from other families of Asparagales, the infrafamiliar structure and relationships are highly complex and in flux, both at the generic and the specific levels. 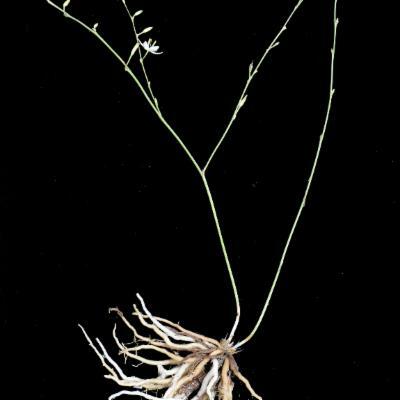 This is evident in several genera and is mainly due to the convergence of floral characters, the high diversification rate and the plasticity of characters. 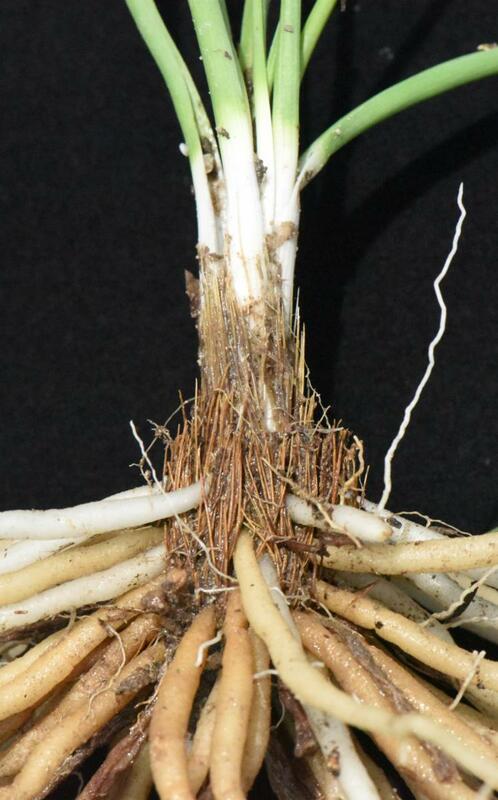 In this treatment Cobana Ravenna is considered synonymous with EleutherineHerb., Larentia is included in AlophiaHerb. because of its panduriform anthers, Itysa Ravenna is considered as a valid genus and differs from CalydoreaHerb. by the presence of stamens positioned opposite the styles. 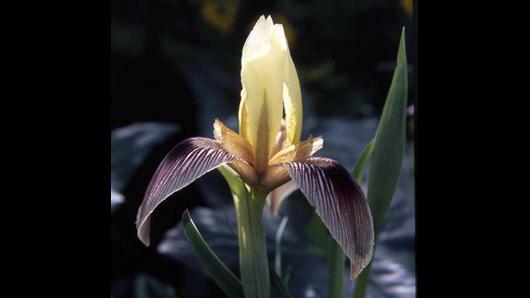 The Iridaceae comprises about 67 genera and 1870 species, with 16-19 genera and 338-358 species in the Neotropics. The family is divided into 7 subfamilies, with only Iridoideae represented in the Neotropics (Goldblatt & Manning 2008). Native, except Crocosmiacrocosmiiflora (Lemoine ex Morren) N.E.Br. native to South Africa and naturalized in Brazil. The family occurs in different habitats such as savannas, high altitude paramos and campos rupestre, secondary forests, borders of gallery forests, and coastal rain forests. Many neotropical Iridaceae genera are adapted for seasonally dry habitats and some prefer truly xeric environments in which their underground systems may remain dormant for a long period. The lack of flowering material in herbaria (flowers often being destroyed in the process of herborization), creates a problem for floral studies as often only materials with fruits are available in herbaria. Many species of Iridaceae are endemics with small populations and/or few occurences, which make them very vulnerable to extinction. The family is widely distributed in the Neotropics from Mexico through Central America and the West Indies to South America, mainly in Brazil. Species occur in a variety of habitats from savannas, seasonally dry forests, to high altitude paramo and campo rupestre vegetation. AlophiaHerb. (c. 5 spp.) - South and Central America, Mexico extending into the U.S.A.
CalydoreaHerb. (16 spp.) - South America. Cipura Aubl. (c. 9 spp.) - tropical South America to Mexico and the West Indies. 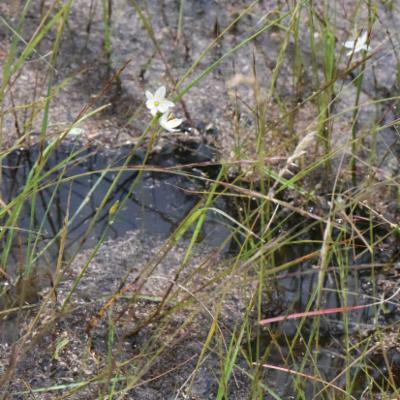 Crocosmiacrocosmiiflora (Lemoine ex Morren) N.E.Br. native in South Africa and naturalized in Brazil. Cypella Herbert (c. 30 spp.) - widespread over temperate and tropical America, mainly temperate South America. EleutherineHerb. (2 spp.) - tropical South America through Central America to Mexico and the West Indies. Itysa Ravenna (2 spp.) - South America. Libertia Sprengel (12 spp., 4 in South America) - New Guinea, Australia, and New Zealand; Juan Fernandez Is, Chile, Bolivia to Colombia. Mastigostyla I.M. Johnston (c. 20 spp.) - Andean South America, Argentina to Ecuador. Nemastylis Nutt. (4 spp.) - southern U.S.A., Mexico and Guatemala. Neomarica Sprague (c. 22 spp.) - South and Central America, and Mexico, mainly along the east coast of Brazil. Olsynium Rafinesque (12 spp.) - Andean and temperate South America, the Falkland Islands, and western North America. Orthrosanthus Sweet (10 spp.) - Australia, and Argentina and Bolivia to Venezuela in South America, and in Central America and Mexico, mainly mainly at high elevations. Pseudiris Chukr & A. Gil (1 spp.) - P. speciosa Chukr & A. Gil, endemic to the campo rupestre vegetation of Chapada Diamentina in Brazil. Pseudotrimezia R. Foster (14 spp.) - endemic to central Brazil. 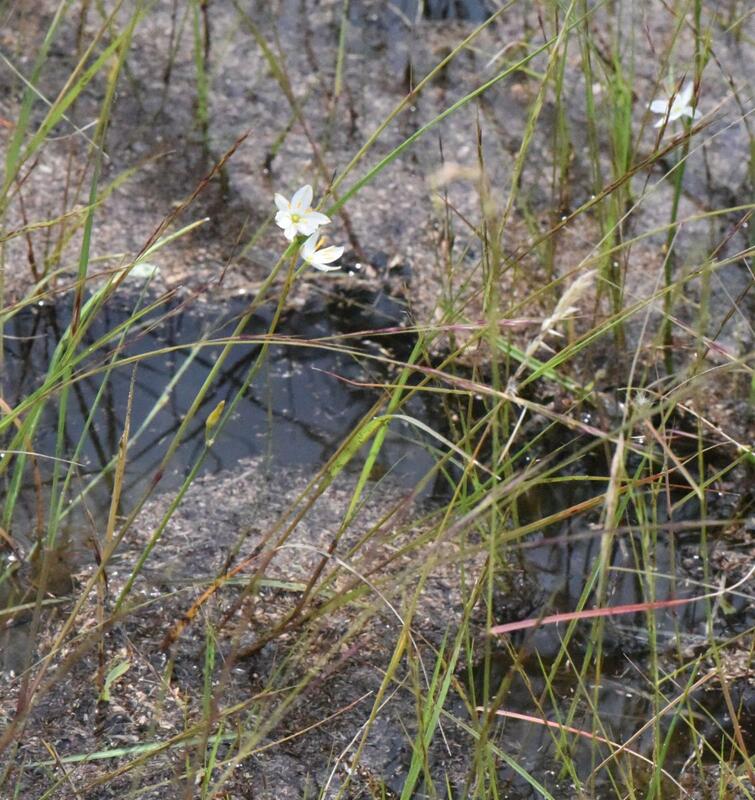 Sisyrinchium L. (c. 140 spp.) - throughout South, Central, and North America, 1 species in Greenland. Tigridia Juss. (c. 55 spp.) - Mexico and Central America. Trimezia Salisb. Ex Herb. (16 spp.) - southern United States and West Indies to northern of Argentina and Paraguay, but mainly the highlands of Brazil, Venezuela and Guyana. Inflorescences in the form of spikes or rhipidia, trimerous flowers, extrorse stamens opposite to the outer tepals; ovary inferior, syncarpous, styles 3, free or partinally united, stigmas entire or deeply divided. Rootstock wrapped by persistent brown fibrous or membranaceous tunic-like cataphylls. Many genera with ensiforms, isobifacial and distichous leaves. Large flowers with showy tepals. Loculicidal fruitcapsule with many angular seeds. Iridaceae differs from Liliaceae s.s. in the number of stamens (three in Iridaceae, six in Liliaceae) and by their inferior ovary (superior in Liliaceae). 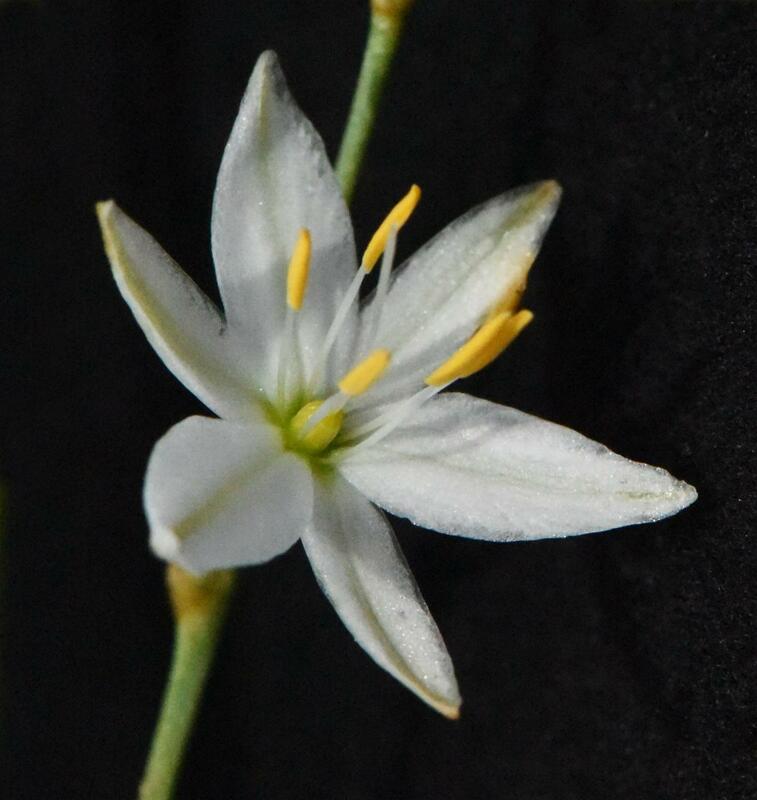 They differ from Amaryllidaceae in the number of stamens (three in Iridaceae, six in Amaryllidaceae) and in the type of inflorescence (umbelliform in Amaryllidaceae and spike or rhipidium in Iridaceae). Alophia: Leaves flat, linear, plicate or cylindrical. Scape cylindrical carrying bracts along their length. Flowers yellow or lilac; outer tepals patent , stamens free, unequal, opposite to the styles, filaments short, anthers oblong with broad connective. According Goldblatt & Manning (2008) the diagnostic characters of Alophia are the freestamen filaments and the fiddle-shaped anthers with a broad connective, resulting in pollen chambers placed laterally on the edges of the anthers. Cipura: Basal leaves flat, linear, plicate. 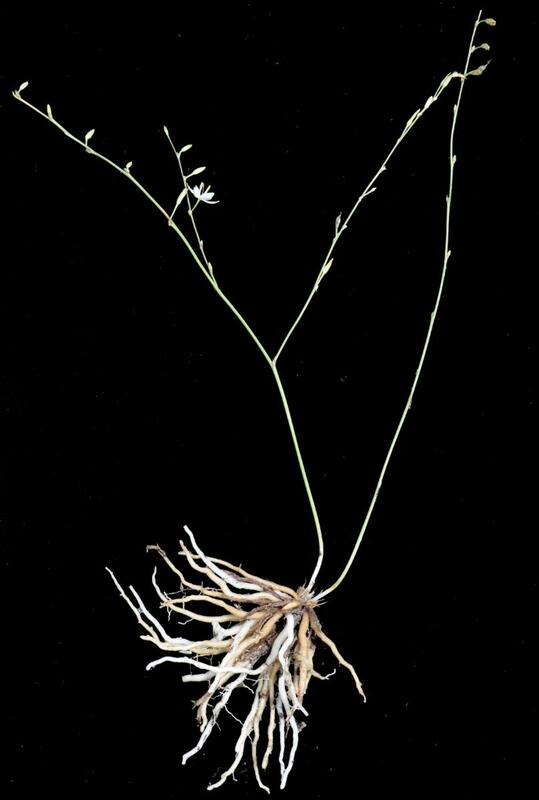 Scapes cylindrical with a large subapical cauline leaf. Inflorescences sessile or with short branches. Flowers blue, white or yellow; external tepals, reflexed or patent, inner tepals obovate to oblong, erect. According Goldblatt & Henrich (1987) Cipura is characterized by plicate leaves and erect, inner tepals that partly conceal the stamens and the style-stigma apparatus. Neomarica: Leaves flat, ensiform. Stem flattened, terminated by a large subapical cauline leaf. Inflorescences crowed apically. Tepals unequal, the outer, patent or deflexed, the inner smaller, pandurate, ascending, stamens erect, opposite the styles. Neomarica is closely related to Trimezia but is distinguished by its flat scape and equitant cataphylls (Chukr & Giulietti, 2001; Chukr & Capellari Jr. 2003). Pseudiris: Leaves flat, ensiform, equitant and conduplicate. Scape flattened, conduplicate with 2-3 covering bracts. Flowers lilac or blue, external tepals obovate-oblong, inner tepals obovate-elliptic, much smaller than the outer ones, stamen filaments filiform, opposite and adpressed to the styles. 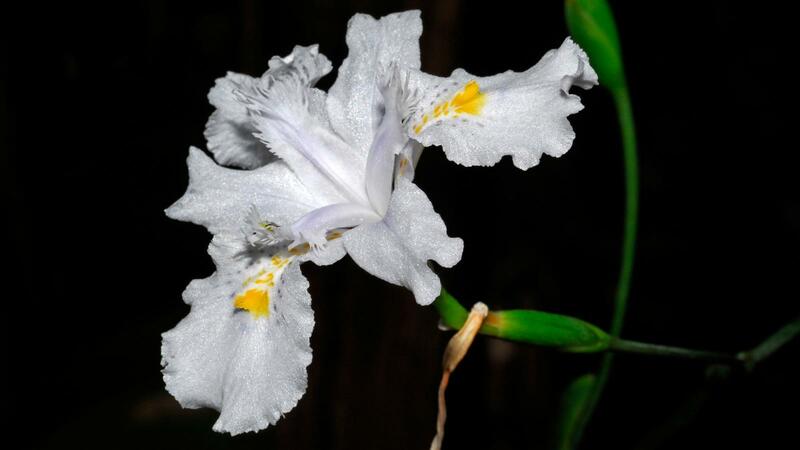 Pseudiris is characterized by a compact erectcorm-like rhizome wrapped by a persistent cataphylls, very showy flowers, but principally by the style branches with two lilac petaloid crests (Gil et al. 2008). Pseudotrimezia: Leaves cylindrical. Stem cylindrical, erect, with or rarely without two steriledistichous bracts. Yellow flowers, tepals patent, subequal, stamens free or united only at the bases, styles three, cylindrical. Pseudotrimezia: is characterized by having small to medium-sized, patent tepals usually without streaks and cylindrical styles undivided or slightly cracked in the upper parts with apical and globose stigmas (Foster 1945, Chukr & Giulietti, 2003). Sisyrinchium: Leaves flat or cylindrical at the base of the stem. Inflorescence, pedunculated or sessile, terminal or lateral, when lateral then a cluster subtended by a large subapical cauline leaf. Lily-like flowers, blue, purple, pink or yellow, tepals subequal, patent, stamens alternating with the styles, filaments flat, glabrous or hairy, free or forming column, styles entire. Trimezia: Leaves flat or cylindrical. Flowers yellow, lilac or purple. Tepals unequal, the outer patent or reflexed, the inner smaller, pandurate, ascending, stamens opposite the styles. Chukr, N.S. & Giulietti, A.M. 2003. Revisão de Pseudotrimezia Foster (Iridaceae). Sitientibus, série Ciências Biológicas 3(1-2): 44-80.Chukr, N.S. & Giulietti, A.M. 2008. Revisão de Trimezia Salisb. ex Herb. para o Brasil.Sitientibus, série Ciências Biológicas 8(1): 15-58. Foster, R.C. 1945. Studies in the Iridaceae III. Cont. Gray Harv. Univ. 155: 3-55. Gil, A.S.B., Chukr, N.S., Giulietti, A.M. & Amaral, M.C. 2008. 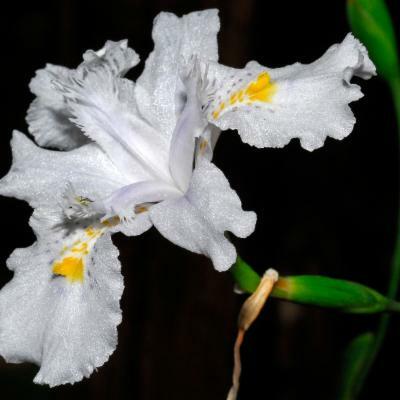 Pseudiris speciosa, a new genus and species of Trimezieae (Iridioideae, Iridaceae) from Chapada Diamantina, Brazil. Proceedings of the California Academy of Sciences, ser. 4, vol. 59(19): 723-729. Goldblatt, P. 1990. 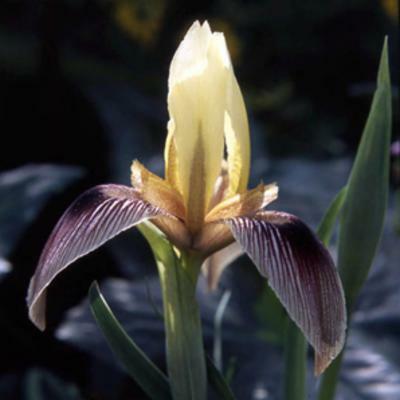 Phylogeny and classification of Iridaceae. Annals of the Missouri Botanical Garden 77(4): 607-627. Goldblatt, P. & Henrich, J.E. 1987. Notes on Cipura (Iridaceae) in South and Central America and a new species from Venezuela. Annals of the Missouri Botanical Garden 74: 333-340. Goldblatt, P. & Howard, T.M. 1992. Notes on Alophia (Iridaceae) and New species, A. veracruzana, from Vera Cruz, Mexico. Annals of the Missouri Botanical Garden 79: 901-905. Goldblatt, P. & Snow, N. 1991. Systematics and cromosome citology of Eleutherine Herbert (Iridaceae). Annals of the Missouri Botanical Garden 78: 942-949. Goldblatt, P., Manning, J.C. & Rudall, P. 1998. Iridaceae. In: K. Kubitzki (ed.). The families and genera of vascular plants IV, pp. 295-333. Springer Verlag, Berlin. Goldblatt, P. & Manning, J.C. 2008. The Iris family: the natural history and classification, 290 pp. Timber Press, London. Hutchinson, J. 1973. The families of flowering plants. III. Monocotyledones. 3a ed. Clarendon Press, Oxford. Klatt, F.W. 1871. "Iridae". In: C.F.P. Martius (ed.). Flora Brasiliensis vol. 3(1), pp. 510-548. Verlag von J. Cramer. Weinheim. Ravenna, P.F. 1981. The tribe Trimezieae of the Iridaceae. Wrightia 7(1): 12. Ravenna, P.F. 1986. Itysa and Lethia, two new genera of neotropical Iridaceae. Nord. J. Bot. 6: 581-588. Ravenna, P.F. 1988a. New species and miscellaneous notes in the genus Trimezia (Iridaceae) - II. Onira 1(1): 1-15. Ravenna, P.F. 1988b. New species and miscellaneous notes in the genus Pseudotrimezia (Iridaceae) - I. Onira 1(7): 48-52. Reeves, G., Chase, M.W., Goldblatt, P. Rudall, P. Fay, M.F., Cox, A.V., Lejeune, B. & Souza-Chies, T. 2001. Molecular systematics of Iridaceae: evidence from four plastid DNA regions. American Journal of Botany 88(11):2074-2087. Sprague, T.A. 1928. Marica and Neomarica. Bull. Misc. Inf. Royal Botanic Gardens, Kew 1928: 278-281. Souza-Chies, T.T., Bittar, G., Nadot, S., Carter, L., Besin, E. & Lejeune, B. 1997. Phylogenetic analysis of Iridaceae with parsimony and distance methods using the plastid gene rps4. Plant Systematics and Evolution 204(1-2): 109-123. Stevens, P. F. 2008. Iridaceae. In: Angiosperm Phylogeny Website. Version 9. http://www.mobot.org/mobot/research/apweb/orders/asparagalesweb.htm#Iridaceae. Accessed 22 August 2011.